The Carroll family are BIG stuffing fans too, we probably have it two or three times a month regardless of the time of year. Shiloh uses the box stuff but then puts in his own sauteed veggies and other yummy stuff that I don't know what he does but it is delish! And now I want stuffing. Wanna come over for dinner? I bet we'll have stuffing this week! Oh Man! That sounds SOOO good. 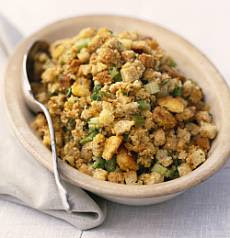 I would so be at your house if you have stuffing haha. And since we're moving tomorrow I'll be out there anyway haha! Just so you know for when you get back- Shiloh bought some enormous stuffing box that contains enough to stuff a 15 pound turkey (so basically 15 batches) and we're only making three for Turkey Day! I'm thinking we'll need to do some finals destressing that involves watching Brian Regan while eating copious amounts of stuffing! Oh my goodness that sounds like a fantastic plan!!! Finals destress, application destress, and just eating stuffing watching the funniest man alive. Could it get better? I submit that it cannot.